3D view of Eagle project. Generating 3D views of Cadsoft Eagle projects can be done with Eagle3D. 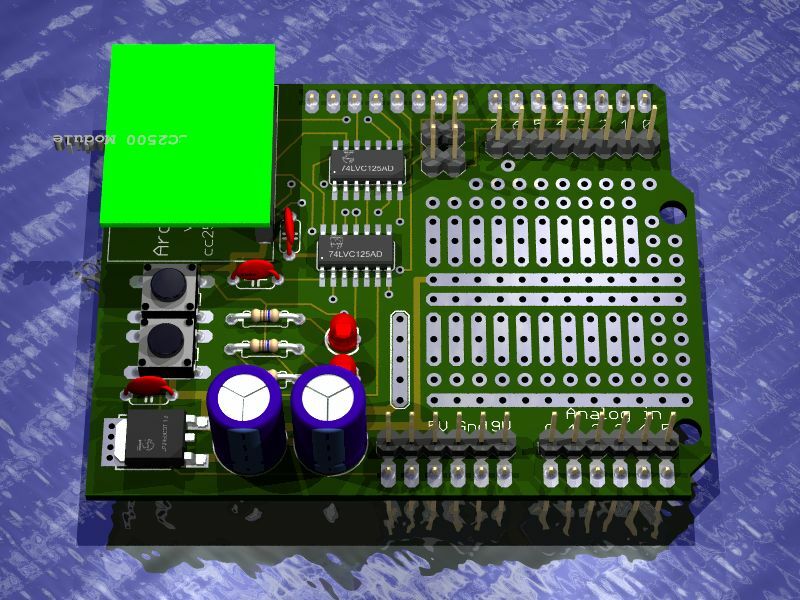 Eagle3D generates POV-Ray scrips from Eagle PCB’s. The board and parts can then be rendered in POV-Ray. I have done this to make pretty pictures of the Arduino CC2500 shields. Eagle project as a 3D design. The problem with Eagle3D is that it only generates images. The 3D design cannot be edited and the data can not be used for manufacturing. A logical solution is to generate a 3D CAD file that can be edited and can be used for manufacturing. The popular choice for product design in the “maker scene” is Google Sketchup. It is extendable in Ruby, and there are are extensions available to export to 3D printers (see Shapeways and Ponoko) and lasercutters via Inkscape and the Faces-to-SVG plugin (see Ponoko). The people behind the Gumstix have done some work on Eagle – Sketchup integration. Documentation is a bit sketchy and the latest projectfiles are from 2009. EagleUp is a set of scripts in Eagle and Sketchup. It generates files and images in Eagle that can be imported with a script in Sketchup. EagleUp is still in an early version but it is well documented. I plan to use it and have been tweaking the code. There are a couple of problems with the Eagle – Sketchup integration. To avoid this issue the EagleUp author scales the design x 1000. That will not matter for the pictures but it could complicate manufacturing and combining parts. Eagle3D has a huge amount of parts available, Matthias Weißer made it possible to make a part parametric and uses one model for say, all pin headers with 4 up to 50 pins. EagleUp parts are Sketchup models and there are only a few available.